Can it stand alongside Mozilla and Ubuntu? All of a sudden, we're spoilt for choice when it comes to Linux-based smart phones. Sailfish OS, a derivative of Meego, is one of the new options we're excited about. It promises to bring a sleek Qt experience to phones in a way Nokia never quite managed, but its facing tough competition from Mozilla and Ubuntu who are both launching their own phones. Which will reign supreme in this highly competitive field? 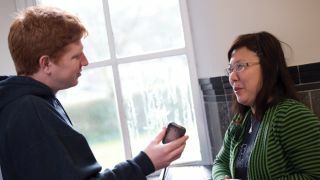 The first Sailfish OS phone is due to go on sale by the end of 2013 and our sister magazine Linux Format caught up with community chief Carol Chen at Jolla, the Finnish company making Sailfish OS happen, to find out the behind-the-scenes news. Linux Format: You're community chief - Is there much community involvement at the moment? One of our markets is in China so I've been going to Beijing and Taiwan and discussing with the open source communities there hoping to get even more involvement. In Europe open source is very familiar and popular and people know what it's all about, but in some parts of the world, not so much. We hope to generate more excitement and passion for that and, hopefully, get more contributions and work on Sailfish OS together. LXF: Android development is quite closed and lead by Google. It sounds like you're not going down that road. CC: No. We don't want to go down that road. We understand that Android is a good platform and is very popular but as you mentioned, it's controlled by the company and most of the development is done behind closed doors even though it is open source. We want to have open development, open source and open communication. LXF: Does that mean there'll be a public source tree? CC: There will be certain components that we want to protect, but the open parts will be in the public. We'll be contributing upstream. You'll be able to grab the code and start using it. We'll have IRC channels. LXF: Jolla has split off from Nokia. How has that affected the people in it? CC: Most of the people are from Meego background, but we aren't a spin off from Nokia. We're not a subsidiary. Personally, my background in Nokia is Symbian, not Meego. When I was in Nokia, I was working on the video engine which is based on the open source Helix video engine, and I got really interested in open source so I got to know the people in Meego really well. When I left Nokia, it was kind of natural for me to talk with the people I used to hang around with in Meego. LXF: There was always an impression outside of Nokia that it had a wonderful system in Meego, but Nokia never quite made the most of it. We are very agile, we make decisions without taking ten meetings to reach an agreement. There's no waiting around for five layers of management to see what happens. I like that. LXF: There's been a lot of talk of Sailfish on Phones. Are you planning on developing on tablets as well?